Terrasses du Larzac is a unique and exciting site in the vast Côteaux du Languedoc, just west of Pic Saint Loup. 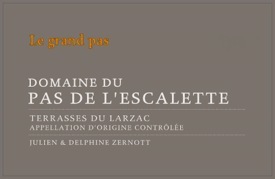 Le Pas de l’Escalette is the historic trail linking the Mediterranean plain to the high Larzac plateau. Not long ago mules were the principal mode of travel along this challenging transitional landscapeLandscape but more recently the completed A75 motorway has advanced the position of the automobile. This unique site is wild and rugged, crisscrossed by myriad streams, limestone outcroppings and caves. The principal cleavage exposing the valley below runs in a north-south direction offering two vineyard orientations: that of the rising and setting sun. Le Causse du Larzac as the locals call the south-western part of the Massif Central offers shelter and a check on the intense summertime heat making this area surprisingly, one of the coolest in the Languedoc. That makes for a longer, tempered ripening season and grapes that retain their balance and acidity. 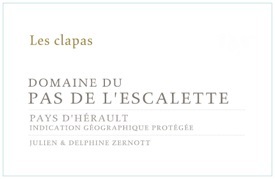 Domaine Pas de l’Escalette’s 15 hectares of vineyard, divided among 30 separate parcels, nestles on 350m high terraces supported by clapas, as dry stone walls are known locally, in the lower foothills of the Larzac plateau. Julien Zernott and Delphine Rousseau began coming to the area in 2001 in the hope that some opportunity would reveal itself. He was well established in the Loire Valley as a consulting oenologist, principally for his work at Domaine Pellé in Menetou-Selon. The couple was now in search of a new beginning along the roadJulien Zernott and Delphine Rousseau less travelled. Among this postcard beautiful landscape they found that road in the form of an estate on the market possessing a collection of parcels super well situated and already being worked organically. Since acquiring the estate in 2003, they have only further elaborated that work and are curently in transition toward organic certification. Early on they worked out of a small cellar in the nearby village of Poujols but have recently completed a new facilty outside of town which is allowing them to comfortably expand production as new parcels have been added since the original purchase. 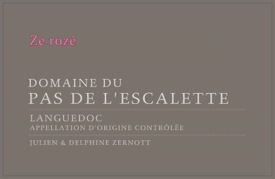 They work pricipally with Carignan and Grenache and a tiny amont of Syrah for the reds as well as Cinsault for the rosé. They were fortunate to have acquired parcels with an average age of 45 years and some beyond 80 years, a large portion being head pruned vines which excel at naturally limiting yields. Half the parcels face east and enjoy the rising sun, the rest face west and benefit from the setting sun. This “under-exposure” was one of the most important factors for Julien in deciding which parcels to work. Grapes are de-stemmed and fermented in 50hl oak casks with native yeast. Malolactic fermentation and aging takes place in smaller wood casks for about 10 months. 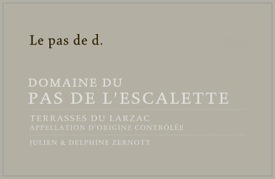 Equal to the rugged terrain and dramitic scenery, the wines of Pas de L’Escalette are elegant, rounded and well balanced. They display wonderfully fresh and fragrant savory aromatics. 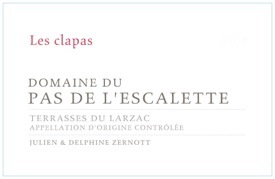 We are very excited to introduce one of the pioneering domaines of this lesser known corner of the Languedoc to our California friends.